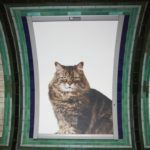 A marketing group in London has papered the city’s Underground stations with cats! Normally covered in ads of every sort, on September 13th the railway stations were instead decorated with cats of every size, shape and color. The ad takeover was intended to “encourage positive values in society” and also features homeless cats in need of adoption. I can’t imagine much better on my morning commute than a sea of friendly cats!